Officially licensed and ready to take on any terrain! 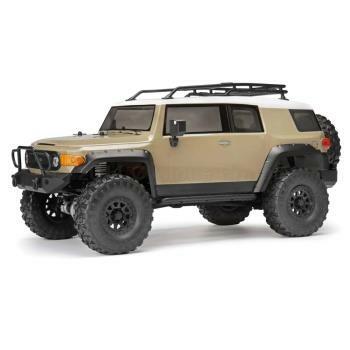 The 1/10, electric Venture Toyota FJ Cruiser Gunmetal Gray 4WD RTR combines spectacular scale crawling with superior realism! A steel C-channel chassis provides the perfect foundation, while the 35T crawler spec motor and transmission are front-mounted-just like on a full-size truck. Other details include a functional roof rack and 1.9? Rockthorn tires mounted on beadlock-style multi-spoke wheels. Factory-assembled and painted, with full-time 4WD. Functional roof rack with side mirrors. TF-40 2.4GHz radio system with waterproof receiver and water-resistant SS-20WR steering servo. Waterproof SC-3sWP2 Crawler Edition ESC. Aluminum coil-over oil shocks with adjustable, threaded bodies. Shock towers with multiple mounting options. 3-link front and triangulated 3-link rear suspension. BTA (Behind The Axle) steering linkage for improved approach/departure angles. Panhard bar for scale looks and optimized geometry with zero bump steer. Zero Ackermann high-steer knuckle design for improved obstacle clearance and tighter turning radius. Adjustable side sliders help overcome tough obstacles. Front-mount motor and transmission position for ultimate scale realism. Locked differentials for superb off-road climbing traction. Rear bumper with swing-away spare tire mount and D-ring shackles. 12 mm hex hubs, compatible with all crawler wheels. Includes NiMH battery, charger and 4 “AA” batteries.